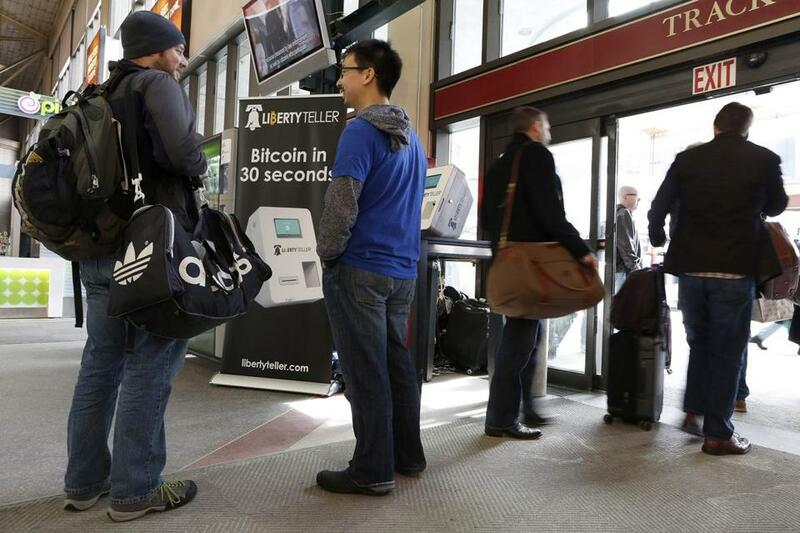 Liberty Teller’s Chris Yim (right) spoke with a traveler at the South Station bitcoin kiosk, one of two in the area. So far, a handful of Boston-area restaurants and retailers accept the currency, whose value is determined by supply and demand. In the one month since the machine in South Station began operating, the value of a bitcoin has fallen about $15 to around $615 Tuesday evening. But it had gyrated over a longer period; in November it hit a high of $1,242. At least two other bitcoin machines have been set up in the United States, in New Mexico and Texas, while another is expected to open this week in California. Barbara Anthony, undersecretary of consumer affairs and business regulation in Massachusetts, said her office is trying to determine whether the machines themselves are similar enough to an ATM that they must be licensed like one. Under Massachusetts law, businesses other than banks that want to install an automated teller machine must get state regulators’ approval. The licensing process provides officials with grounds for rejecting a machine. Liberty Teller cofounder Chris Yim said his company is not deterred by the state’s strongly worded warning. Yim said about 500 people have used the kiosk at South Station, and he added that he has constantly cautioned consumers to weigh the benefits and risks of using the currency. Proponents argue bitcoin is faster and cheaper to use than other money-exchange programs or credit cards; it does not, for example, have the transaction fees common to debit and credit cards. And though the bitcoin system was vulnerable to theft, so too are credit cards, Yim said, noting the enormous heist of card data recently from Target Corp., the retail chain. “Every time you use a credit card, you’re turning over information for possible identity theft,” Yim said. Digital currency is “like the Internet in the early days” — an innovation with huge potential but also a lot of misunderstanding to overcome, Yim said. Before the kiosks, the only way to get bitcoins was to buy them through an online exchange or to accept them as payment from a bitcoin holder. The founder of Clover Food Lab, Ayr Muir, said he agreed to install the machine in his restaurant on Holyoke Street in Cambridge after being approached by Yim, who like him graduated from the Massachusetts Institute of Technology. The rapid rise of bitcoin and other virtual currencies has flummoxed traditional financial regulators, including those who oversee securities and banks. They are struggling to define the crypto-currencies with traditional financial definitions — is it a banking transaction or an investment, for example — that would then determine how or even whether they should be regulated. So far, only one arm of the federal government, the Treasury Department’s Financial Crimes Enforcement Network, has weighed in definitively, classifying businesses that exchange real currency for virtual currency as money transmitters similar to Western Union that are subject to federal regulation. But the newly installed chairwoman of the Federal Reserve, Janet Yellen, recently said the central bank does not have the authority to regulate bitcoins. The use of virtual currency is “entirely outside the banking industry,” she said during a Senate Banking Committee hearing. Meanwhile, a group of state banking regulators from around the country, led by David Cotney of Massachusetts, established a task force in late February to investigate digital currencies, including bitcoin. Issues being studied by the group include whether services related to bitcoin are operating legally. “I think everybody is trying to get their hands around how to deal with this,” said Jon Skarin, senior vice president at the Massachusetts Bankers Association. Virtual currencies are not federally insured, so consumers have no protection if they lose money or their accounts are hacked. Bitcoin has also been associated with unsavory elements. It was the favored currency on the defunct website Silk Road, which allegedly served as a trading post for drug trafficking and money laundering. And the sudden collapse of the bitcoin exchange Mt. Gox about a month ago has led to mistrust in the currency. In a bankruptcy filing in Japan, Mt. Gox said it may have lost the equivalent of about $520 million to hackers. Robert Boutwell, a lawyer at Sally & Fitch LLP in Boston who specializes in bank litigation and has written about virtual currencies, said that market acceptance for bitcoin has increased in recent months. Prominent businesses such as Overstock.com and the Sacramento Kings have announced they will accept bitcoins for purchases, he said. Kyle Alspach can be reached at kyle.alspach@globe.com.